Genevieve is newly married, resplendent in her gown and wearing a slim wedding band. This was a moment when she wasn’t posing for a photograph or engaging with her guests or new husband, Ian. Their wedding ceremony and celebration in a pavilion at London Zoo was a very enjoyable occasion. As a photographer more at ease with architecture than human life, I didn’t expect to harness a wealth of moments. 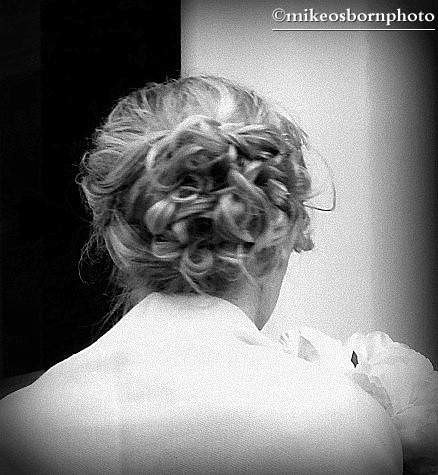 I also captured Genevieve’s bridesmaid Rachel, her hair arranged in a complex and fascinating twist of curls. Thanks Chris. A bit of a departure for me! Thanks Richard. I find this hard work, but candid at a wedding always wins the day. Absolutely. I like to think the second shooter is not under such immense pressure to deliver the expected shots. I was one of many taking photos that day, and very glad about that!